When it comes to watch terms, most people are likely familiar with a band or a strap. They’ll certainly know that a watch has hands. 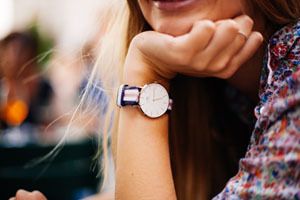 They might even be familiar with the term “face.” After that, most consumers probably don’t know a whole lot of watch terms. That’s not criticism; most people don’t have to know such things. On the other hand, most people who aren’t interested in watches at all don’t visit sites like this one. If you are here, it’s because you do have an interest in designer watches or luxury watches that goes above and beyond that of the average consumer, who might simply want a device that displays the time. Sadly, those consumers are moving away from watches more and more and gravitating towards smart phones, but that’s a gripe for another blog post. Automatic – Also known as “self-winding”, an automatic watch is one that does not ordinarily require winding. We say “ordinarily”, because such watches do need to be wound. Automatic watches have an off-centered weight inside that rotates when the wearer moves their arm. This winds the watch’s main spring, resulting in stored energy that can be used to operate the timepiece. Of course, if an automatic watch is stored for a prolonged period of time, it will run down and will have to be manually wound to get it running again. Daily wear usually prevents this. 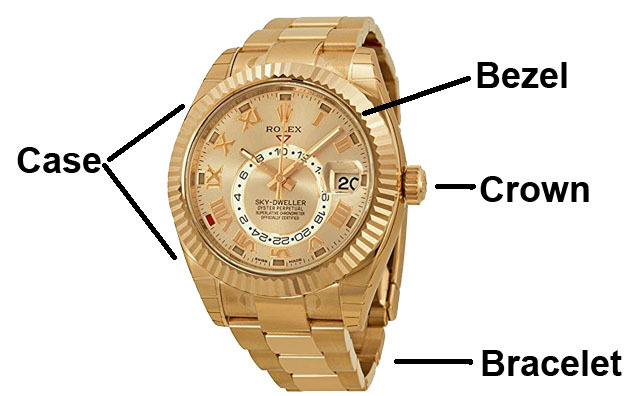 Bezel – The bezel is the metal ring that surrounds the crystal that covers the watch face. Bracelet – Also known as a strap or band, this is the part of the watch that wraps around the wearer’s wrist and allows it to be, well, a “wrist” watch. Case – The case of the watch is the housing, usually made or steel, that contains all of the elements that make up the watch. While cases are usually steel, they may also be made of gold, plastic or other metals such as titanium. Cases must be sturdy in order to protect the delicate mechanisms inside them. Chronograph – A chronograph is a watch that contains more than one timekeeping element, usually in order to time the duration of an event, such as a race. Chronographs can be quite complicated; we’ve written a detailed article about chronograph watches here. Complication – In most situations, the word “complication” means “problem.” In the world of watch terms, it refers to any mechanism contained within a watch that does something other than tell the time of the day. Complications might include calendars, stopwatches, tidal indicators, phases of the moon indicators, and more. As a rule, the more complications a watch contains, the greater the price. Crown – The crown is the button used to wind mechanical watches. It can also be used to set the time and date. Some models of watches have a “screw-down” crown, which secures it so that the time is not accidentally changed without the wearer’s intent. Crystal – The protective glass that covers the watch face. Crystal is a descriptive term; it may describe a covering made of plastic, mineral crystal, sapphire crystal, or some other transparent material. Diving watch – A wristwatch that was designed specifically for use underwater for divers. Such watches are usually chronographs, and have an adjustable ring on the bezel that allows the wearer to observe the amount of time that has elapsed since they began their dive. This protects them against running out of air. Most diving watches are rated for specific water depths, and a few are rated for extreme depths measuring many thousands of feet. Face – The part of the watch that has the numbers measuring the time; it’s the part of the watch that you look at when you want to know what time it happens to be right now. Hands – On traditional watches, the hands are the long indicators that point to the numerals in order to indicate the time. 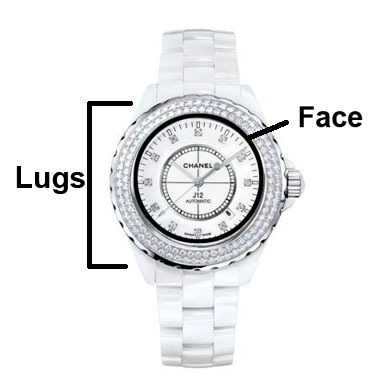 Lugs – Lugs are the metal parts, usually on the top and bottom of the case, to which the band, strap, or bracelet attaches. Without lugs, you’re looking at a pocket watch. Mechanical movement – This is the opposite of an “automatic” or “self-winding” movement, though those movements are technically mechanical, as they have moving parts. In watch terms, “mechanical movement” refers to a watch which must be manually wound in order to function. Self-winding or quartz models don’t qualify. Movement – The mechanism within the watch case that enables the device to determine the time. The movement is what makes a watch a watch. Power reserve – The amount of time or energy remaining in a mechanical watch before it stops working. A number of automatic watches have a power reserve indicator as an additional complication. Quartz movement – An electrically powered movement that uses a vibrating quartz crystal, rather than moving parts, to allow the watch to keep accurate time. The introduction of quartz movements in the late 1960s caused panic in the watch industry, as longtime watch manufacturers were certain that the public would no longer be interested in buying mechanically-operated watches. Some were right; many companies went out of business in the mid-1970s due to decreased demand. Tourbillon – Believe it or not, gravity can affect a watch’s ability to keep accurate time. 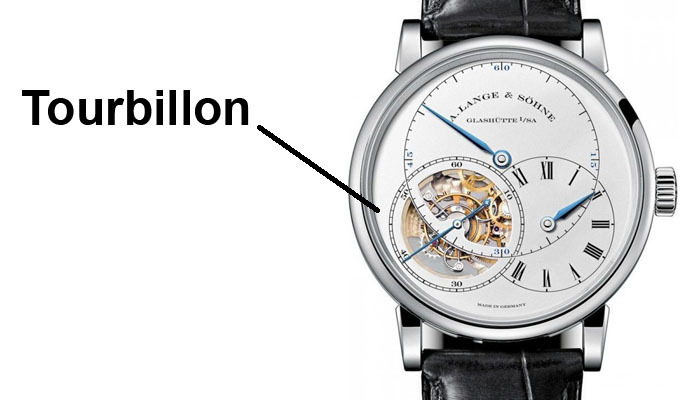 A tourbillon is a mechanism contained in some watches, built within a rotating cage, that helps offset the effects of gravity in order to allow the device to keep more accurate time. Obviously, the list of watch terms listed above is far from complete, but anyone who is just starting out in collecting wrist watches may find that list to be a good starting point. Over time, you’ll learn about other terms and become more acquainted with watches in general. OK on watch terms and ready to buy? Click here to shop for designer watches at Amazon.